The latest Chromebox from ASUS is bringing us techies a lot of excitement — rightfully so. As a Chromebook owner, it is easy to see the delights and appeal of this friendly and easy to use OS (essentially Google Chrome with extensions and web apps) and see the power of having a small Chromebox (desktop version of the Chromebook) attached to a large display, such as your HD TV. Couple watching media through the new ASUS Chromebox. 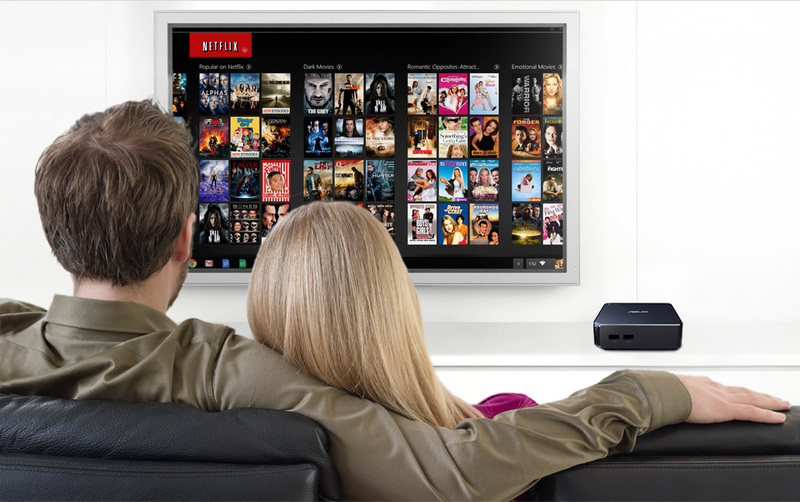 Think of the possibilities of having a desktop operating system on your TV. The entire internet will be right on front of you with no compromise. Google TV attempts to bridge the gap between an app ecosystem in Android and some say that it has not been successful. As a Google TV owner, it is a great experience with a few shortcomings; however, this solution might be viable due to the ability to bring the entire Chrome ecosystem to your set. Note, this is not the first Chromebox just the first Chromebox with this small form factor. Bottom line: Grab a wireless keyboard and mouse and you have a full entertainment system in front of your eyes. This is definitely a step up from Google TV, which is missing critical apps such as Hulu Plus. Previous Previous post: Innovation Gone Missing? Next Next post: Does Build Quality Matter?